Before Audrey was born, I ordered several new products from the Sephora Friends and Family Sale. Now that I've been using them for a while, I thought I would update you on how they've been working for me. I've been using this eye gel nightly, as recommended. It is a bit sticky, but not enough to bother me. 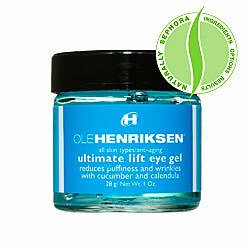 This gel claims to reduce puffiness, sagging and wrinkles around the eyes. For me, it seems to reduce puffiness a little bit and there is a nice, cooling sensation when applied. My eyes definitely feel more refreshed in the morning after using this...definitely something I need after being up 3 to 4 times each night feeding Audrey! At $38 this is a great value; just a little bit of this gel goes a long way, so it will definitely last a very long time. 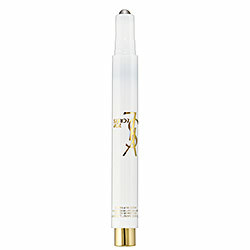 This product is supposed to reduce signs of fatigue around the eye area. I haven't seen a great difference in my eyes when I've used this. I haven't used it everyday, but maybe if I did, the results would be more noticeable. I feel that it's a bit pricey at $44 and the packaging is not the greatest either. Sometimes I have to click the button on the bottom of the tube more than once before the product comes out and overall, there seems to be very little product for the results and the price. I'll use this more often before I decide if I'll buy it again, but at this point I'm not sold. I know I'm way late to the party on using this product, but I finally bit the bullet and bought it. For the longest time, I didn't see a point in using an eyeshadow primer, but now that I have been using this one, I wonder why I waited so long to try it. 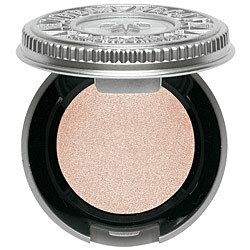 My eyeshadow now has more staying power and the primer even makes my cheaper shadows look more pigmented. I highly recommend this product! I love this tinted moisturizer! It gives me just enough coverage to look like I haven't just rolled out of bed, but not enough that it looks like I'm wearing a full face of foundation. 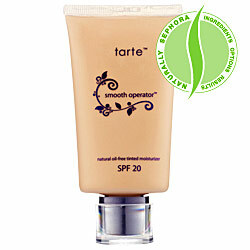 It gives my skin a glowing look without being too shiny...and I love the fact that it's SPF 20 for extra protection. For your reference, I wear "Agent 02" and I'm quite pale. I'll definitely continue to buy this product! 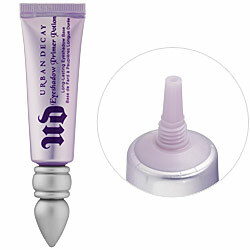 I don't know what I've been doing all this time, not using Urban Decay eyeshadows! The pigment is amazing and I love the Polyester Bride shade in particular for highlighting my brow or the inner corners of my eyes. It does have a shimmer to it and some sparkly fallout, so take note of that if you're looking for something that is more matte. I love this shadow so much that I just purchased their Naked 2 palette from my friend Mary who had an extra one. (Thanks Mary!!!) Sephora actually just got more of them in stock though, if you are looking for one! I'll be sure to follow up with a review of the palette once I've tried it out, although I'm sure I'll love it. I hope these reviews were helpful! Have you recently tried any new beauty products that you're loving? Let me know in the comments! I've also been resisting trying an eyeshadow primer but i think I might have to use my Sephora gift card from Christmas to get it! DO you know a great product that would really make acne scars disappear? Hey Gayle, I don't know of any, sorry!